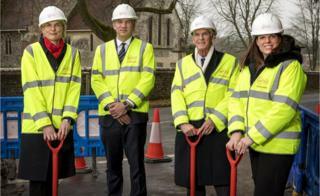 A local campaign, in conjunction with Virgin Media, has brought fibre broadband to rural communities in Hampshire. Up to 4,000 residents in 12 villages in Test Valley and Dun Valley will be able to access "ultrafast" internet from late 2019. Virgin says it is currently almost impossible for some residents and businesses to download or upload files. The scheme will provide them with a 350Mbps connection. In order for the network roll-out to be commercially viable, at least 30% of residents had to register their interest in having such a service. The telecommunications provider also required at least 1,000 residents to commit to a broadband services contract. The Financial Times reported each customer will face a £300 connection fee. While Virgin Media is already active in other rural areas, until now it has done so by extending its existing urban operations. What makes the new scheme unique is that the network is being built from scratch. Virgin Media said a broadband advocate community group representing the 12 villages contacted it in 2016, asking that the company bring its fibre network to their area. As a result, the telecommunications provider did not find it difficult to get residents to commit. The scheme attracted a sign-up rate of on average 38% across the valleys, while some villages had a take-up of 78%. "Virgin Media's commitment to this project has been fantastic and I am very pleased to see how quickly the build has already progressed," said Caroline Nokes, MP for Romsey and Southampton North. "Access to fast broadband is essential for modern life and prior to this project, four wards in my constituency were in the lowest 10% for broadband speeds in the country. "That changes this year and I am delighted for all those who will soon have a 21st century infrastructure in their community." Independent telecoms analyst Ian Grant said that residents in rural areas are increasingly turning to rural initiatives because they have been "disappointed" by BT. BT owns the infrastructure provider Openreach, which owns almost all telephone wires, exchanges, cabinets and ducts in the UK. "Every single county council in the country gave their fibre contracts to BT, and BT has not rolled out fibre to the rural communities - hardly at all," he told the BBC. Mr Grant thinks that BT has missed an opportunity, because even in rural areas, people need the internet. Apart from recreational use, farmers require a consistent internet connection because they need to file regular reports to the Department of Environment, Food and Rural Affairs (Defra). However, he does not think that Virgin Media will start providing a fibre network in all rural areas. "It's much cheaper to service a bunch of people in a block of flats in an urban area, than it is to service a shepherd on a Cumbrian hillside," he explained. It is likely that more communities will either ask telecoms providers to build them a network by promising to take up contracts, he says, or by starting their own non-profit companies and investing to build private networks, as seen with Broadband for the Rural North (B4RN). "People in rural areas feel they have been neglected by BT, and they are willing to talk to anybody who is prepared to give them a better service," said Mr Grant. Openreach told the BBC: "No company is investing more than Openreach to improve broadband services throughout Britain. "We've spent £11bn on upgrading our network over the last decade and, thanks largely to our work alongside government, 95% of the country can now order a superfast broadband service." Openreach added that it is also upgrading three million homes and businesses to "full-fibre" broadband technology by the end of 2020. Regulator Ofcom reported that 98% of UK homes could access broadband speeds of 10 megabits per second or faster as of the start of 2017 - a higher proportion than France, Germany or Spain. But it added that the UK "continued to trail" on the availability of "ultrafast" products providing 300Mbps or more.